Now in its sixth generation of family ownership and operation under Astrid Schmitz-DuMont, the oldest brewery in Cologne remains world-renowned for its continued production of the Kölsch-style ale it popularized around the turn of the 20th century. 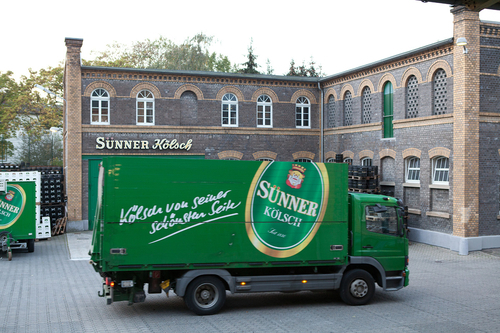 Though the Kölsch style is now brewed internationally, no one brews it quite as well as Sünner. True to the slogan, the Sünner brewery is a remarkably beautiful facility and the oldest historical building in Cologne that still functions for its original purpose. From outside, an imposing brick facade frames a large window, offering views of the polished copper kettles within. The inside of the brewery has been modernized, but has not sacrificed its traditional design, and when possible, utilizes traditional equipment, like its open fermenters. Adjacent to the brewhouse lies a large, 400-seat beer garden built in 1996. When the weather’s nice, it’s open every day but Monday from April to September. You can also enjoy a meal and drink underneath the brewery in its repurposed cellars. Remodeled into a bar and restaurant in 2009, the cellars offer a cozy, well-lit environment to enjoy a Kölsch within the intimate brick walls. Contained in the brewery is the only registered spirits distillery in all of Cologne, also in operation since 1830. The distillery allows Sünner to stay in touch with its core values of ​​craft, tradition and regionality by producing smaller batches, like its gin or limoncello. These small batches allow for more experimentation than the brewery’s core beer lineup, and the unique softness of Sünner water makes for a distinct interpretation of modern spirit styles that go down smooth. When possible, Sünner even uses its original oaken barrels for spirit maturation. The brewery shop, located at the rear of the brewery, offers all Sünner products for sale, including some you won’t find in the U.S. These include, spirits, a hefeweizen, a Malz (malt), water direct from the brewery’s source, sodas and lemonades. True to the slogan, the Sünner brewery is a remarkably beautiful facility and the oldest historical building in Cologne that still functions for its original purpose. The care Sünner puts into preserving its history is only matched by the extreme care put into brewing its beers. 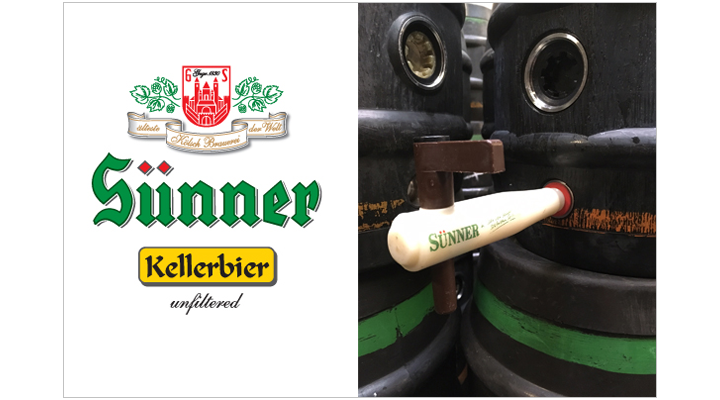 Longtime champions of consistency and subtle, technical brewing, Sünner only uses high-quality raw materials: locally grown, organic barley, hops from the famous Hallertau region, specially cultivated house yeast and particularly soft brewing water from an on-premise well. The well is fed by an underground water vein, contributing to the distinctly pure and refreshing character of Sünner products. Sünner is the originator of the modern Kölsch style (though it wasn’t called that then), first being brewed around 1900. Sünner is a true ‘Kölsch’ beer, in that it is unique to Köln (Cologne) Germany. Like Champagne, Kölsch is protected by laws so that only beers brewed in that region can truly bear the name. It is an ale with a stylish character derived from a lengthy lagering process. It is clear and pale straw in appearance. The taste is refreshing, gently fruity and slightly sweet with a crisp, dry finish. 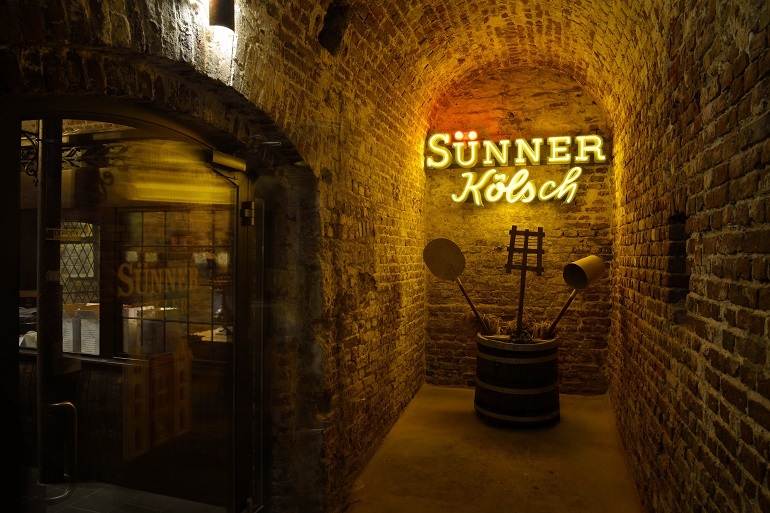 Sünner Kölsch is so synonymous with beer in Cologne that servers typically only ask you if you would like a beer – without offering a selection – because Sünner Kölsch is the widely-assumed beer of choice in the city. Available in 16.9-ounce bottles and 30-liter kegs. Sünner Kellerbier is the unfiltered, fresh-from-the-tank version of Sünner Kölsch. It has a hazy appearance and a more intense flavor than Kölsch. The aroma is yeasty, slightly hoppy and bready. On the palate, Sünner Kellerbier is fuller in body than normal Kölsch and has a more complex, very dry, character with notes of hay, bread, honey and a nice, clean bitterness. Both Sünner Kellerbier and Sünner Kölsch are served in small, straight-sided glasses called Stange glasses. The small size of the glasses makes it easy to quaff multiple refreshing Sünner brews. Available in 30-liter kegs. 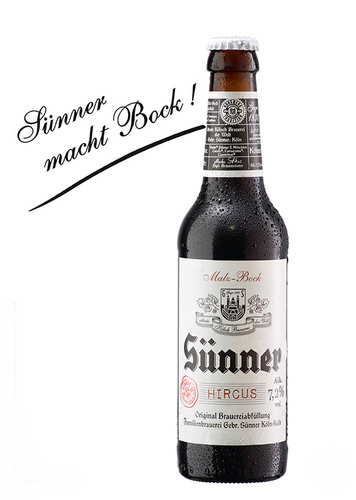 Called a “Malz-Bock” in Cologne, we’ve never tasted anything like Hircus! Made from a very high gravity mash, full of specialty malt, the finished beer is elegant and creamy. Ripe, rich malt, chocolate and caramel blend seamlessly into a long, full finish. The nose is delightfully sweet with a herbal, classically German noble hop character. Malts used include Weyermann Barke Münchner, Barke Pilsener, Carafa, CaraAroma and Carawheat. Hops used include Hersbrucker, Tettnanger and Hallertau. And the yeast used is the Kölsch yeast on overdrive! *Available draft only in the United States. Distribution: In the U.S., look for Sünner Kölsch in local beer and liquor stores, both chain and independent, as well as specialty grocery outlets including Whole Foods and Total Wine. 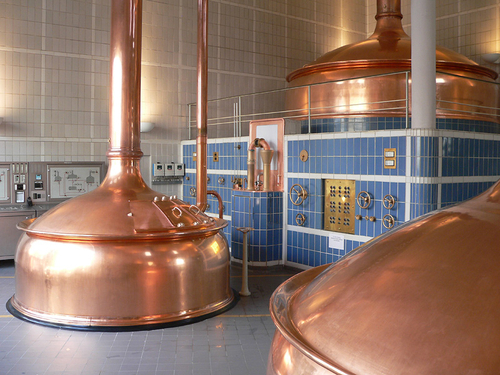 Tours: Brewery tours for groups of up to 25 people are available upon reservation, and the price per 75-minute tour is just under 10 Euros, which includes one Kölsch and one Kellerbier. After touring the brewery, visitors may also choose to visit the neighboring Sünner Keller, or seasonal beer garden, featuring comfortable outdoor seating and games, friendly staff and a delicious selection of fresh food. For more information on tours and visits to the cellar and beer garden, click here.